Gateway Church envisions people being saved, healed, set free, discipled, equipped, empowered, and serving. Everything we do revolves around those seven things. 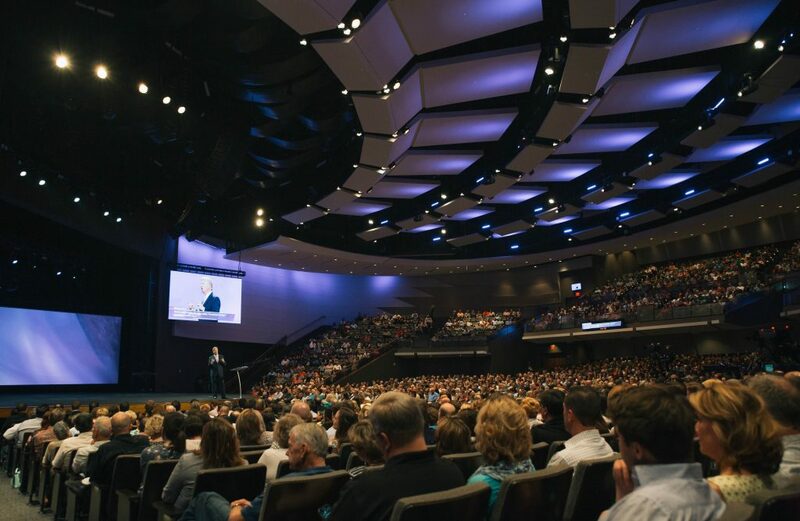 It starts with weekend services — up to five in a weekend per location — originating from our main Southlake campus and broadcast to five other campuses across the Dallas/Fort Worth Metroplex. But we believe church is about more than just a weekend service, especially in a church of our size. It’s about meeting people where they are and giving them opportunities to connect with the church in their own communities. To that end, we’re also a church of small groups. We call them Gateway Groups. There are groups for women, men, young adults, students, single parents, and a variety of ethnicities; groups that study the Bible; and groups that offer help with finances. Hundreds of Gateway Groups meet in communities throughout Dallas/Fort Worth. Beyond that, we hold classes, cultural events, and multiday, multi-speaker conferences. All of that activity generates a lot of content. For example, there are 63 different ministries, each with its own content to record. All told, we’ve added several terabytes of content to storage every month for 15 years. That translates to about 300-400 terabytes of storage for our weekend sermons alone! We’ve been using Square Box Systems’ CatDV media asset management system for several years now, and its rock-solid performance and rapid response time have proven invaluable in handling a library as large as ours. From the beginning, CatDV made sense for us. Not only was it the most affordable and easiest to use of all the MAMs we explored, but unlike many other MAMs, CatDV lives on top of the existing file system. That meant we could import all of our files without changing the folder structure. Given the amount of time we had spent organizing our files, it was a huge relief to know we wouldn’t have to change anything. Another thing we really appreciate about CatDV is how intuitive it is. Once you get going, it’s fairly easy to figure out how to do whatever you need to do, and if you have questions, the help guide is useful. (We’ve also gotten excellent support from JB&A, our CatDV representative.) Another system we tried required extensive knowledge in order to find or manage content, which meant we couldn’t rely on volunteers to help out. CatDV solved that problem. Now, because of the user- friendly interface, volunteers can easily find content for us, which frees our technical staff to do what they were hired to do. Because it contains every sermon, CatDV is the first place we turn when we get a request for information. If a pastor asks us to recall a specific sermon from six years ago, we can find it — and everything else related to that topic if necessary. We also share video of services and material with other churches in our area, so if we get a request for all of our calls to worship, for example, we can easily find the file and send it off. of the assets are ingested, CatDV will manage nearly 1 petabyte of content — and counting. That means we’ll have Gateway’s entire video history at our fingertips, making it easy to access and use any clip, whether we need it the next day or years down the road. Matt Wilson is the Director of IT User Experience, and JD Spivey is the Creative Director of Postproduction, Gateway Church.